As the lead singer and founder of “No Mercy”, he is an internationally known Gold and Platinum recording artist who has scored four Billboard hits and has sold over 10 million recordings worldwide. 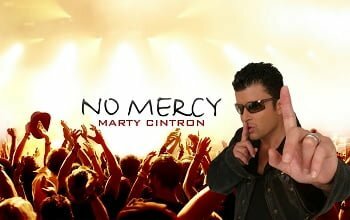 No Mercy’s music has been featured in the films “A Night At The Roxbury” and the ACB-TV series Lois and Clark. It is hard to find artists who have had such a whirlwind of success and have managed to not only stay grounded but also maintain a positive and appreciative attitude. Marty Cintron’s passion and love for music not only launched him but has enabled him to survive and continue with gratitude and gratefulness. His personality, extraordinary guitars, vocals, and producer talents are infused into “No Mercy’s” music with a distinctive energized atmosphere. His upbeat songs are gracefully tempered while his ballads highlight vocal harmonizing. Call it pop-ular music that blends house, pop, soul, R&B and Latin rhythms with the Mediterranean beauty of the Spanish guitar thus creating an infectious groove with a mix of fast-paced dance and soulful love songs. The music of “No Mercy” is uniquely recognized worldwide. Currently, “No Mercy” has been touring throughout Europe and Russia and recording new music in his Miami, Florida studio.